Libcast is a simple and inexpensive live and on-demand online video platform (OVP) that targets small businesses and academic institutions. Based in Bordeaux, France, Libcast serves companies across Europe. Pricing starts with a free plan for one user with 3GB of storage and unlimited traffic, but limited access to portal customisation options and other features. A $49/month plan includes 50GB of storage and up to 10 users, but no live broadcasting. At $99/month, you get 100GB of storage, unlimited users, and live broadcasting (which I didn’t test). With the $399/month plan, you get all that, plus portal customisation options. Libcast’s strongest feature is its flexibility; you can customise most design elements and control access to content on a video-by-video basis, or by channel, subchannel, or on the site as a whole. This makes the platform ideal for educational institutions that want to control website appearance and access on a class-by-class basis, or for organisations that want to present a different look to different viewers in different departments. From a technical perspective, Libcast is a bit behind the times, but should catch up by this autumn. Specifically, though you can create multiple iterations of the uploaded or live file, those files aren’t distributed adaptively—the user has to select the iteration he or she wants, and Libcast won’t adjust to changing bandwidth conditions. Moreover, though Libcast can control access to your videos, the platform can’t prevent those with access from downloading the videos with simple browser-based download tools. This summer, however, Libcast plans to implement HTTP Live Streaming within an HTML5-based player, which will provide adaptive streaming and make it more difficult to download files. Though very solid in general functionality, Libcast lacks essential features for vertical-type applications such as marketing and training. For example, U.K.-based Nideo can capture email addresses for lead generation and track views by social media site to help gauge the success of your social media campaigns. Multiple training-oriented platforms offer more granular user-level viewing details and the ability to administer quizzes and award certifications. For general-purpose use, however, Libcast presents a very solid core of extremely flexible functionality. Here’s a quick overview of site operation, which I’ll follow with a deeper dive on all topics. As with all online video platforms, high-level operation involves managing content and users. You can organise the display of content into channels and subchannels, and your viewers can watch videos within a simple portal provided by Libcast, or insert them into your own sites via embed codes. You manage users through a system of profiles, roles, and accesses. Briefly, profiles determine users’ ability to get into features in the system, while roles determine their publication and viewing rights. Accesses control a user’s ability to access videos in a particular channel. Users can be organised into groups, which control the roles and accesses of those users, a simple way to restrict multiple users to a single or multiple channels. The administrative interface is simple and well-laid out, with most controls and major operational sections simple to find. As you see in Figure 1, menu options on the top control access to your uploaded content (my documents), channels, player customisation, monetisation (which I didn’t test), and analytics. The little gear that I’ve opened on the far upper right provides access to general administrative functions, creating users and groups, and defining profiles and roles. 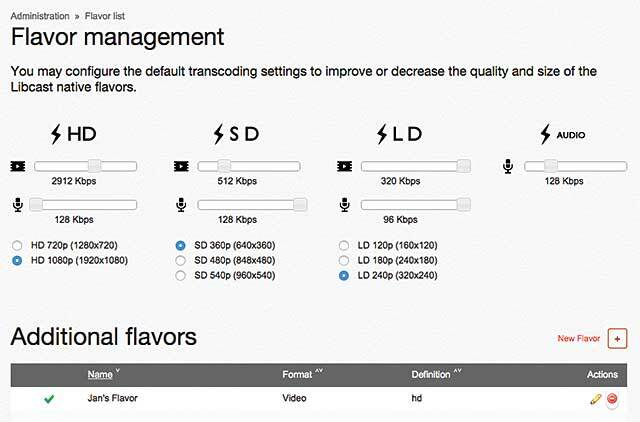 The flavours section is where you define the encoding profiles applied to all video content included in the system. You can add users individually, import them from a spreadsheet file, or synchronise with an existing database, such as Active Directory or via LDAP. As mentioned, each user is assigned a profile, which determines system-related rights. For example, the administrator profile shown in Figure 2 has near-universal control over the system, but only a super administrator can manage price (which isn’t enabled on the upper right). Roles are defined with a similar screen and control access to media and channels. So a moderator might have total access to create, manage, and delete content, while viewers can only view the content and access player-level controls, such as the ones for sharing via social media. Combined with accesses, roles enable the system to limit media-related capabilities to a particular channel or channels, or even down to a particular video. Figure 3 contains a list of users that demonstrates how roles and accesses fit together, though it’s actually an amalgam of two screens. 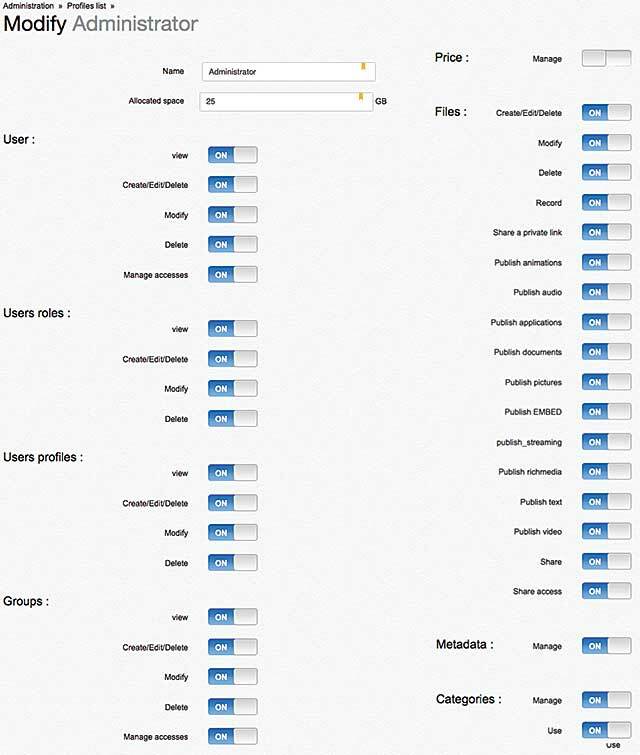 On top is the list that contains the profile assigned to each user, which confers system-related rights. On the bottom is the accesses list that you open via the green icon to the extreme right of the figure. 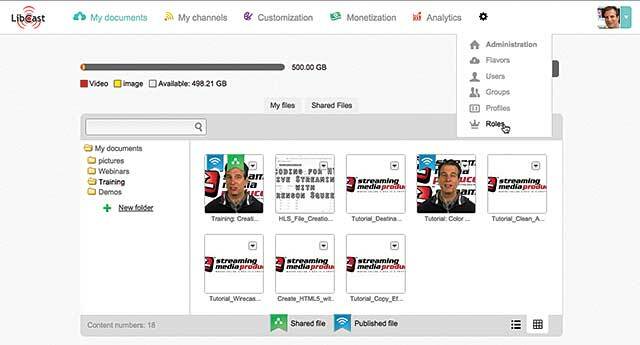 Combined, the two views shows that Marketing Maven has a profile of Marketing Assistant, which enables extensive video creation and editing capabilities, but no rights to configure the system. Those capabilities are limited by the accesses list on the bottom of the figure. That is, Marketing Maven enjoys a moderator role for videos in the marketing channel (called container) but only a viewing role in the other channels. 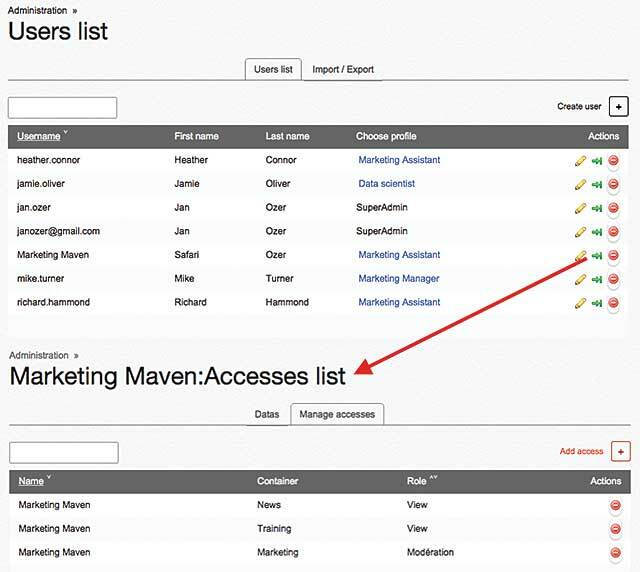 Groups of users work the same way, with profiles defined on one screen, and accesses and roles defined in an accesses list. Taken together, profiles, roles, and accesses enable a high degree of granularity regarding access and control. In a corporation, for example, you can assign a training professional moderation rights for training videos, but only viewing rights to other videos. In an educational institution, the department head might have moderation rights for all channels in the department, with each representing a particular class. Individual professors might have viewing rights over all channels, but moderation rights only for their own channels, while students get viewing rights only for content in the classes they are taking. Though the labels are a bit confusing, note that there is no moderation workflow that triggers a review by a one person after another user uploads a file. In other words, if you wanted a department head to review all videos uploaded by workers in the department, there’s no way to do that. That’s an overview of the user side. Let’s switch our focus to content. You manage all content in the my documents section, which Libcast calls the briefcase. Assuming that you have the necessary rights, you can add content to the system by uploading a file or files, or recording an audio or audio/video file via a Flash-based recorder. Each user has his or her own storage limit quota and can store and organise content in his or her own folder. Once in a library, you can share the video so it can be viewed and modified by other viewers, or publish it for general viewing, an important step I’ll get to in a moment. Within the briefcase, you can modify the video, which incorporates activities such as choosing a thumbnail, adding metadata, trimming the heads and tails, inserting a logo over the clip, and inserting a separate clip before or after the video. You can also create a simple playlist that plays all videos in the channel or subchannel. There’s also an editor called Studio, in which you can create shorter excerpts of longer clips, insert chapter points into a video, add slides from a document uploaded into the system, and add subtitles. I tried the chapter point feature, which worked very well in my tests. It’s a great way to break up longer lectures or training sessions into shorter, more accessible chunks, which is always useful. Libcast’s encoding strategy is also straight-forward, though a bit dated. That is, each file is encoded into at least three flavours, or encoding configurations (Figure 4). The SD and HD configurations are for computer playback, the LD for mobile. You can add your own flavours, if desired, which is why you see the ‘Jan’s Flavor’ at the bottom of the figure. Each file is encoded to these presets automatically after uploading. If you change the flavours, or add another, you have to manually trigger a re-encode on a video-by-video basis. During playback on computers, you can switch between flavours manually, but mobile viewers always get the lowest-quality file. Libcast plans to introduce true adaptive streaming via HTTP Live Streaming (HLS) this summer, a very welcome addition to the delivery schema.